If you've been working hard on a formula or design and are looking to complete the aesthetic of a product, then you've come to the right place - labels for beauty products from Lightning Labels look fantastic and are high-quality, too. Stick these labels to bottles of lotion, shampoo, conditioner, bath soaps and perfume, and see how easy branding your products can be. Design labels for beauty products with Lightning Labels and bring in more business. Every time someone buys a beauty product from your store, they'll practically be a walking advertisement for your brand as these labels show off your company name and logo. Be as creative as you want - go ahead and choose clear or saturated labels in a variety of sizes and shapes. Be confident when you hand over a product to a customer - affix beauty product labels from Lightning Labels on each item and know that the customer loves the way it looks. Even the best formulas and designs need a marketing boost, and beauty product labels are just the trick to turn a dull container into something stylish that reflects your company's personality. Beauty product labels from Lightning Labels are completely customizable, too. If you have a tricky design in mind, come work with Lightning Labels pros and make sure you get exactly what you want out of a label. It's your business, so make the most of it and order beauty product labels today! 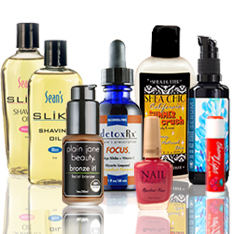 Order Health and Beauty Labels from Lightning Labels Today! Go online to the Lightning Labels website and get a free instant online quote for beauty product labels today! Call us at 888-907-3004 today to place your beauty product label order and get ready to be impressed!